Here’s a holiday dinner-party conversation starter for anybody who is into cars: What would you park in your dream garage? It’s a fantasy game that will appeal to anyone who subscribes to car magazines or rubbernecks at passing Maseratis or buys vehicles only with a third pedal. They can fill their imaginary garage with priceless Ferraris and classic Astons. But let’s be reasonable about our dreams for a moment. Picture a three-car garage that’s attainable. Three vehicles that you could buy now, without betting it all on black first. There have to be practical considerations, too. Three SUVs means a garage without a lot of diversity, only two-seat sports cars means never picking up someone from the airport, and three sedans means fewer Sunday drives along A1A. So we’ve filled your garage here with three incredible new cars that will win any dinner-party contest. It is. Although, to be honest, the TTS has only 292 horsepower, which, compared to a lot of sports cars, is fairly pedestrian. But who-knows-where-it-comes-from power is among the things that will surprise you about the TTS. The car’s styling has stayed so consistent over the years that it’s flown under the radar of your average gearhead. The most recent update, though, has given this car lines as sharp as a tailored jacket, bulging fenders and a grille that looks like a permanent grimace. With all-wheel drive, it would be hard to find a car that handles better, that tight German steering so accurately eating up a highway exit ramp. The acceleration is slow off the line, until the turbo kicks in. The sound too is pure sports car: It’s low and bassy at first, up to snare-drum solo when the RPMs peak, and then, during a quick shift, the exhaust adds a sharp clap. Before the TTS pulled away from him, that confused co-worker peeked through the window and caught a glimpse at what has to be one of the world’s most driver-focused interiors. Instead of a touch screen and a bunch of dials in the center of the car, Audi has moved nearly all of it to a screen directly in front of the driver, sharing space with the tach and speedometer. Right there in front of you, barely requiring you to take your eyes off the road, is the navigation and the radio controls and nearly everything else. The only thing you’ll need to reach for are the climate controls, which are smartly placed in the center of the air vents. The back seats are just big enough for a well-behaved lap dog, but while most two-seat sports cars mean there’s no room for reclining, the TTS’s tiny back seat does allow a road-trip passenger some napping room. And the trunk, with the seats folded, will hold a pair of golf bags or an entire cart of groceries – although not both. Audi Coral Springs, 5555 N. State Road 7, Coral Springs, 954-509-8960; Audi Fort Lauderdale, 1200 N. Federal Highway, Fort Lauderdale, audifortlauderdale.com; Audi Pembroke Pines, 15000 Sheridan St., Pembroke Pines, 954-620 2000; Prestige Audi of Miami, 14780 Biscayne Blvd., North Miami Beach, 888-514-1995, prestigeaudimiami.com. Indian River Drive snakes for 15 miles along the Intracoastal Waterway as it heads from Jensen Beach to Fort Pierce. It’s rarely a straight line, meandering left and right and up and down, over old sand dunes and shell mounds. On one side are homes that run from unique pioneer Florida bungalows to McMansions, and on the other side are brackish waters seemingly always reflecting sunlight on little whitecaps. There are few better places for a Jeep. It’s not just the salty breeze coming through the T-top. This is a road where Jeep owners wave casually at each other, a little recognition of the beachy lifestyle that seems bolted to the frame. To be clear, the Wrangler rides like an Army surplus vehicle. Turn the steering wheel at high speeds and there are two inches of wiggle room in the center. Go over bumps quickly and you’ll feel like a lug nut shaken in a Mason jar. But that’s also what makes it so much fun. Buy an entry-level two-door Wrangler and you will get a stripped-down truck well suited for a camping trip. But spring for a special package, like the top-end Hard Rock edition, and you will get a vehicle full of leather, a backup camera and plenty of off-road upgrades. That’s the thing about a Jeep. Maybe it’s an impractical daily driver. But take it up to Indian River Drive, remove the T-top and the sunlight splashes in. In a Jeep, it often feels like you’re on the way to a new adventure. Arrigo Dodge Chrysler Jeep Ram Sawgrass, 5901 Madison Ave., Tamarac, 954-515-5800, arrigosawgrass.com; Autonation Chrysler Dodge Jeep Ram Pembroke Pines, 13601 Pines Blvd., Pembroke Pines, 954-441-2000, autonationchryslerdodgejeeprampembrokepines.com; Hollywood Chrysler Jeep, 2100 N. State Road 7, Hollywood, 888-746-2506, southfloridachryslerjeep.com; Joey Accardi Chrysler Dodge Jeep Ram, 909 S. Federal Highway, Pompano Beach, 954-943-6700, joeyaccardicdjr.com; Massey-Yardley Dodge Chrysler Jeep, 777 N. State Road 7, Plantation, 954-327-4032, fortlauderdalejeepchryslerdodgeram.com; Schumacher Chrysler Dodge Jeep Ram of Delray, 2102 S. Federal Highway, Delray Beach, 561-454-1800, schumacherchryslerdodgejeepramofdelraybeach.com. Our wives got into the back seats on the way to dinner. They reclined the seats and popped a bottle of champagne. They turned on the massagers. They adjusted the radio and the climate from controls in the rear center console. They raised the window shades to dim the setting sun. “It’s like we have our own master suite back here,” one said. The truth is, behind the wheel of the Lexus flagship is the second-best seat in the house here. Sure, the engine is wonderfully quick and the handling quite excellent and the tech so easy to master. But the near-limolike Lexus LS460L is really built for the executive in the back seat. OK, sure, there are plenty of other land yachts out there. Many would say the BMW is more of a driver’s car, which is true, although few in this class want a vehicle that can corner on the racetrack. Audis and Mercs might have more cache. But if you’ve reached the point in your life where your sedan costs as much as a mountain cottage in Carolina, you know it’s not about spending money for a label. For your luxury sedan, you want a master suite. To get that in the LS, spring for the $15,960 “executive class” upgrade, which adds those massaging recliners, four-zone climate and TV screens on the backs of the front seats. Not enough leg room? There’s even a button in the back to move up the front passenger. Stretched out back there, champagne flute in your hand, sinking into the plush leather, is there any more comfortable way to travel to dinner? JM Lexus, 5350 W. Sample Road, Margate, 800-805-3987, jmlexus.com; Lexus of North Miami, 14100 Biscayne Blvd., North Miami, 888-292-3189, lexusofnorthmiami.com; Lexus of Palm Beach, 5700 Okeechobee Blvd., West Palm Beach, 561-291-6004, lexusofpalmbeach.com. Like when your daughter brings home a new boyfriend, or you walk into a sketchy Airbnb rental, you know deep down that looks can be subjective. No doubt that’s true with cars, too – take, for example, the rear end of the Panamera or the new Prius. 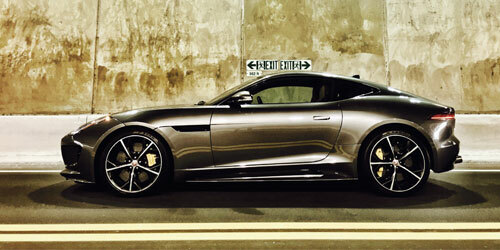 But with the F-Type, we’re just going to assume everybody’s going to want to get behind the wheel. Jaguar’s sports car entry, best in the upgraded F-Type R trim with all-wheel-drive, looks crouched and ready to attack. The face is a predator baring teeth, dark snarling grille, narrowed eyes for lights, angled side mirrors like ears back and ready to pounce. It’s not the fastest six-figure sports car nor equipped with the highest high tech, but let’s just say you’d understand your daughter being smitten if her new boyfriend pulled up in one. Alpine Jaguar, 6606 N. Andrews Ave., Fort Lauderdale, 877-854-9641, alpinejaguar.com; Jaguar Palm Beach, 915 S. Dixie Highway, West Palm Beach, 866-347-5322, jaguarpalmbeach.com. BMW’s big sedan is a rolling tech conference. It’s a car for those who wait in line for the newest smartphone, always knows the hottest apps, can talk at length about virtual reality. The techies will marvel at the iPad-like device that handles everything from climate to radio controls. They’ll soak in the windshield’s 3D heads-up display, which even has a little icon to show the speed limit. (Technophobes might feel otherwise, especially when trying to adjust something as simple as the seat massagers involves poring over multiple touch screens). This is a BMW, so as you’d expect, the acceleration, even in the smaller six-cylinder, is throw-you-back-in-your-seat quick. It’ll also hang tight in turns, even though the body roll will feel like it wants to go sideways. Of course, it won’t go sideways, because this Beemer is full of computer-assisted driving brilliance, lane departure and adaptive cruise. This car will keep you from ever going astray. Lauderdale BMW of Fort Lauderdale, 1400 S. Federal Highway, Fort Lauderdale, 954-527-3800, lauderdalebmw.com; Lauderdale BMW of Pembroke Pines, 14800 Sheridan St., Fort Lauderdale, 954-620-5050, lauderdalebmwofpembroke.com; Vista Motor Company, 744 N Federal Highway, Pompano Beach, 954-942-7400, and 4401 W Sample Road, Coconut Creek, 954-935-2700, vistabmw.com. The Hellcat appears – at least at first – to be a very reasonable sedan. Four doors. Ample back seat. Trunk that never ends. All of that, yes – plus an engine with 707 blood-curdling horsepower. OK, so it’s a sports car. And a sedan. And not only is the Hellcat insanely fast, it’s also a car with an interior full of soft suede and sharp stitching and fine technology. It’s also fairly understated, with only a hood scoop and a few snarling cat logos here and there to give away what’s smoldering under the hood. This is the most powerful production muscle car ever, but it could be mistaken for a car you’d take to work. Which would honestly be a bad idea. Seven-hundred-plus horsepower is enough to make tires squeal every time you accelerate, constantly tempting you into bad decisions in a work setting. In a dream garage, though, you’d just keep this car parked away, most days. Then, when you feel like causing some trouble, you’d have a four-door Hellcat ready to let out. Joey Accardi Chrysler, Dodge, Jeep, Ram, 909 S. Federal Highway, 954-943-6700, joeyaccardicdjr.com; Massey Yardley Jeep Chrysler Dodge Ram, 777 N. State Road 7, 954-343-8853, masseyyardley.com; Rob Lambdin’s University Dodge Ram, 5455 S. University Drive, 954-332-1421, universitydodge.com.